At first sight, Pink Vanguard seems to be a modest flower with small buds. However, once she starts blooming, she will demand all attention with her bright color intensity. These bright colors are special for peonies in general. The peony is half filled: it looks like she is shining. We are convinced this peony will trigger a revolution in the peony world. Pink Vanguard was created by breeders Seidl and Hollingsworth. The registration took place in 2005. Another famous creation by Seidl is Pastelegance, a popular salmon peony with pastel peach shades. 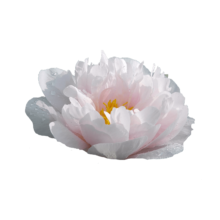 Exclusively in France we dispose of this absolutely beautiful peony. Before blooming, Pink Vanguard appears fragile and humble. In bloom this peony takes you by surprise with her exuberant heart and intense colors. Do not judge too soon at the sight of her smal, lilac buds. When this flower opens up, she will definitely make up for her size.